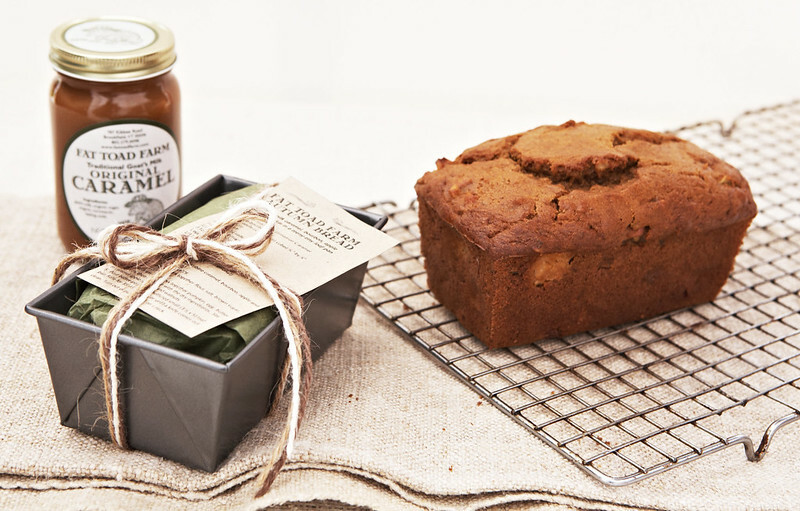 Salted bourbon goat’s milk caramel, apple, pumpkin bread in a teeny-tiny loaf pan – the perfect holiday gift! 1. In a small bowl, combine caramel, bourbon, apple and set aside. 3. In a small bowl, fork together flour, salt, brown sugar, and baking soda. 4. In a medium bowl, mix together pumpkin, egg, butter and spices, then combine with the dry ingredients. Stir in caramel apple mixture and walnuts. 5. Pour batter into a well-buttered small (3 ½ x 5) loaf pan. Bake for 35-45 minutes or until a knife comes out clean. Turn out of pan to cool on a rack.